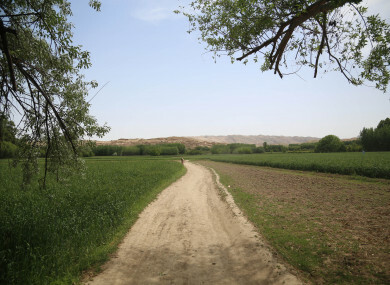 File photo showing a pathway in Sholgara district of northern Balkh province, Afghanistan. SITARA AFADAR YEARNS for long hair like other girls. Instead, the Afghan teenager has disguised herself as a boy for more than a decade, forced by her parents to be the “son” they never had. “My father always says ‘Sitara is like my eldest son’. Sometimes… I attend funerals as his eldest son” – something she would never be allowed to do as a girl. If they realised that an 18-year-old girl was working morning to evening in a brick factory then I would encounter many problems. I could even be kidnapped. Sitara started working at the factory when she was eight, following in the footsteps of her four older sisters, who also made bricks instead of going to school – until they married, after which they stayed home. She makes 500 bricks a day in return for 160 Afghanis (just over €1.60). From 7 am to 5 pm she crouches on the ground preparing mud and clay and then pushing it into brick moulds under the hot sun that has turned her skin brown. But what should I do? I don’t have any other choice. All the responsibility is on my and Sitara’s shoulders – we have to provide for the family and pay back the loans. If I don’t work we will face a lot of hardship and problems. Email “In rural Afghanistan this girl lives as a boy because her family never had a son”. Feedback on “In rural Afghanistan this girl lives as a boy because her family never had a son”.